Spray a 6 quart crock pot with cooking spray, then place the chicken pieces in the bottom. In a bowl mix together remaining ingredients. Pour over chicken, and mix. Cook on high for 1 hour, and then on low for 3-4 hours. *Optional: To thicken the sauce, make a cornstarch slurry (equal parts water and cornstarch mixed to a paste like texture) and add to the sauce, allowing it to come to a boil and thicken. * If adding stir-fry vegetables, heat a small amount of the sauce in a wok, and cook the vegetable until tender, serve along with the chicken on hot rice. When making rice add some chicken bouillon to the water before it boils, adds some flavor to any dish. If making a beef dish add some beef bouillon. I do this instead of adding any butter or extra fat. Seriously simple, yet amazingly delicious! We just love this meal, with both the lemon and lime. I love to serve with with chopped green onions on top, and some fresh lemon. This is kid approved, and my go to recipe for a lazy dinner! 5 stars. Oh Kim - you outdid yourself with this one. Looks so amazing and you know my love for the Crock Pot too...lol. Mateja, thank you so much! I am excited to get to pass on this great award! I feel so honored. Brandie, thanks girl! I seriously love this recipe. It's SO easy, I've made this countless times the last year and always forgot to take a picture. Wow that looks awesome. Great crock pot dinner. Slow cooker meals make me happy too. The house smells so good when I get home from work and I can just get to the eating without all the fuss. Great job! I love crockpot meals too. They are so awesome, kind of just put them on autopilot and let it go. I also love crock pot dinners... they are so juicy and tasty. 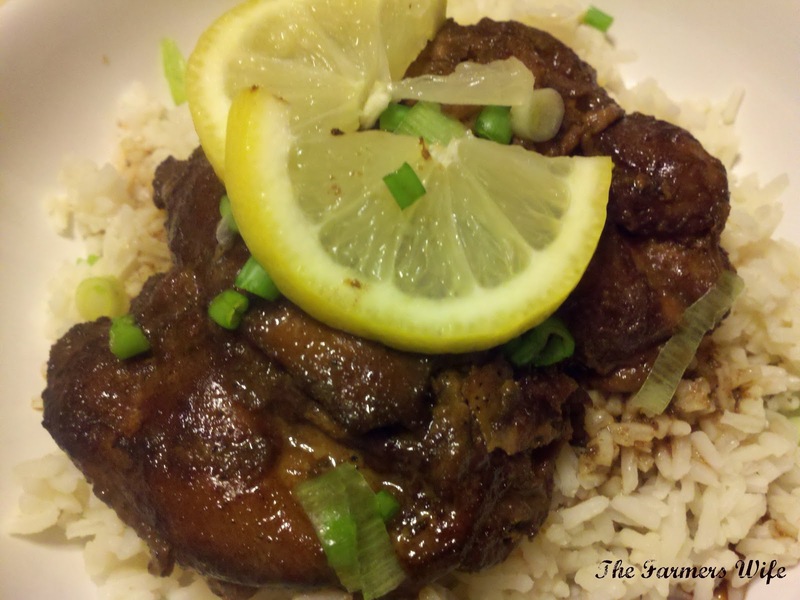 I mostly love the flavors of your chicken...lemon and garlic, yummmm! This looks and sounds great. I love using chicken thighs, so much flavour in them. I'll have to remember this because it's right up my street! Thank you everyone! I certainly hope you enjoy this, it truly is a wonderful dish! I'll have to try this one. I've got all the ingredients except I have chicken breasts instead of thighs. I love crock pot meals too! I can't wait to try this!